The WSOP Tournament of Champions voting will end on Tuesday June 15th. Letting a majority of the seats be decided by the voting public seems to have been a popular idea, and reinvigorated the tournament which hasn't run since 2006. 27 players will take to the felt in what is effectively a $1 million freeroll. I originally thought it was going to be a winner-takes-all affair, but actually 1st place will pay $500,000, 2nd $250,000, 3rd $100,000, and 4th through 9th $25,000. Only bracelet winners are eligible, although a 9-man SNG featuring an elite field of non-bracelet winners is being held today (June 10th), with 1 spot going to the winner. There have been some creative attempts to get you to vote for the candidates. Tom Schneider suggested he would split any winnings with people that voted for him. Also, Marty Smyth promises to donate any winnings from the tournament to charity. However it looks likely that the people that will be voted through will be the "same old faces" that we are used to seeing on television. Tried out a new schedule to try and hit the traffic in the 180-mans when it's hot, so I can concentrate purely on them. Definitely enjoyed this aspect of it, although playing 7pm-2am kinda schedule isn't something I've managed to sustain in the past. Will give it a trial period and go from there. 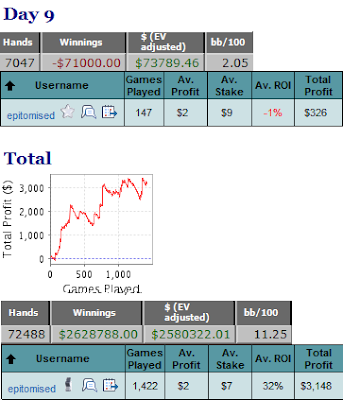 Had a decent enough day, but of course daily results are fairly insignificant due to the variance involved in 180-mans. 3 Comments to "WSOP Tournament of Champions (+ SNQ Day 9)"
Loving your blog updates as ever! All the best for the Supernova quest. I know im already listed in your blogroll so thanks for that. Ive given you a shout out in my most recent blog post and also aimed a question towards yourself or any other 180man regs. If you could take a second to have a quick look and reply it'd be appreciated as always. Keep up the excellent blogging.